Originally founded during the 1930s, Alaska Airlines, formerly known as McGee Airways at the time, started out with the purpose of connecting Anchorage, Alaska to the contiguous United States. Things have changed over the last century as the presently Seattle based company has bloomed into one of the most successful American intra-national airline company. Leading other airlines in customer satisfaction for nearly a decade, Alaska Airlines offers quite a bit of convenience to travelers looking to fly within the home country. Supplementing this convenience and proving their customer satisfaction reputation, Alaska Airlines offers other ﻿airline ﻿credit﻿﻿﻿ cardsspecifically tailored to improve the experience when flying with Alaska Airlines; these cards are known as the Alaska Airlines Visa Signature Credit Card and the Alaska Airlines Platinum Plus® Credit Card. There are two sets of benefits available to potential cardholders of an Alaska Airline credit card: Visa Signature benefits and Platinum Plus® benefits; the more desirable set is the list of Visa Signature benefits which is meant for applicants with excellent credit. Platinum Plus® card details involve some harsher interest rate penalties as well as lesser rewards which makes the Visa Signature Credit Card a much sweeter deal. Starting with the Visa Signature Credit Card, members are eligible to a 25,000 bonus mile reward upon approval. Considering the value of bonus miles of the Alaska Airline Mileage Plan, this is quite a hefty gift to receive without any sort of spending requirement for the first few months of holding the card. These bonus miles are redeemable for flight discounts or potentially free airfare. 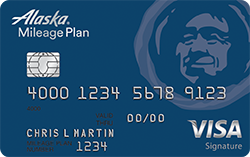 Building on the Alaska Airline Mileage Plan, miles are rewarded for using the Visa Signature Credit Card on purchases ranging from travel tickets to groceries. Cardholders receive three bonus miles for every dollar spent on eligible purchases including Alaska Airline tickets, vacation packages, or cargo purchases. When making general everyday purchases such as gas or groceries, one bonus mile is awarded for every dollar spent. Check h﻿﻿﻿﻿ere for other great rewards credit cards. Those enrolled in the Alaska Airline Mileage Plan do not need to worry about any sort of miles expiration because these miles stay valid throughout the ownership of the card. Additionally, there is no cap limit for these cards. There are multiple discounts associated with the Visa Signature Credit Card. Users receive a discount on a companion’s ticket when buying through Alaska Airlines with the Alaska Airline Credit Card. There is a $50 discount to the Alaska Airline lounge which is an exclusive club for Alaska Airline patrons. The final discount benefit is a free bag check on the first bag as well as up to six passengers which makes this a possible discount on seven bag checks. The counter part to the Visa Signature Credit Card, the Platinum Plus® Credit Card, offers considerably less benefits since it is meant for applicants without a desired credit history. Platinum Plus® cardholders earn two miles for every dollar spent on associated Alaska Airline purchases, and one mile is awarded for every dollar spent on general common purchases. These miles do not expire and are not limited. One of the best benefits involves a $50 annual discount on airfare which is a nice surprise that Visa Signature cardholders do not receive. Various fees and penalties are associated with these two different credit cards. Starting with the annual fee, Visa Signature cardholders are required to pay $75 annually while Platinum Plus® cardholders need to pay $50 every year. The transaction fees and penalty fees do not differ between cards. There is a $10 or 5% fee on regular transactions when needed. Balance transfers are charged either $10 or 3%. Direct deposit or check deposit cash advances receive a $10 or 3% fee; an ATM or over the counter cash advance is charged $10 or 5%. While there are two different rates for cash advances or balance transfers, one rate is chosen based on which generates a greater value. All foreign transactions are charged an additional 3%. Penalty fees for a late payment are $37, and a returned payment fee is $27. There are several different annual percentage rates (APR) for the Platinum Plus and Visa Signature Credit Cards. The regular APR is 14.49% for the Visa Signature Card while the Platinum Plus® card has an APR of 14.99%. The same exact rates are applied to balance transfers for each respective card. When in need of a cash advance, Visa Signature card holders pay a 17.49% APR while Platinum Plus® cardholders pay 17.99% APR. The penalty APR for each card is 29.99%. Alaska Airline certainly provides a desirable credit card opportunity to those who are devoted to the airline, but the main issue is obtaining the Visa Signature card over the Platinum Plus®. Only those with excellent credit can be approved for the better deal, but with this issue aside, the Visa Signature Credit Card offers many beneficial travel awards that any Alaska Airline patron can use effectively. The Platinum Plus® Credit Card offers many less benefits, but this card can offer a way towards to the preferred Visa Signature Card while offering some of its own benefits along the way.